Rome, 68 A.D. Novius Senna is one of the most feared men in Rome. He’s part of the emperor’s inner circle at a time when being Nero’s friend is almost as dangerous as being his enemy. 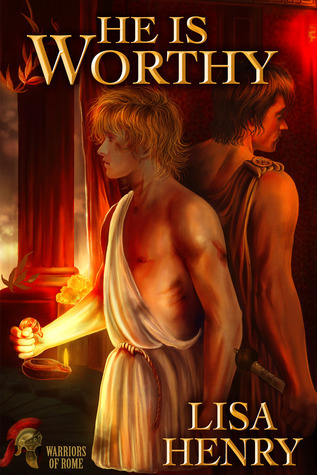 Senna knows that better men than he have been sacrificed to Nero’s madness—he’s the one who tells them to fall on their swords. He hates what he’s become to keep his family safe. He hates Nero more. I don’t often read slave-fic, the power imbalances bother me. I do however, read historicals, the more accurate the better. I took a chance on the slave aspect here in order to reach first century Rome through Lisa Henry’s words, and I am very glad I did. The blurb hints that the need to assassinate Nero and get Rome out from under his pustulent thumb is foremost, and it is. Senna’s function is to tell prominent men that they no longer enjoy the favor of the emperor, a code universally understood to mean “Go kill yourself.” And they did. His last straw was delivering this message to a victorious general, and from then on Senna watched for the right assistant to engage in the suicide mission of taking Nero out. Aenor, the Bructeri slave and Nero’s plaything, still has enough spirit to act. “Do you hate Nero?” Senna asks, and Aenor can tell him in broken Latin, “I hate him. Hate all of you.” With reason. The men are together for reasons other than love or attraction, yet something blossoms between them. Loyalty. Respect. The atmosphere in this book is incredible. I was absolutely present in the slave markets and in Nero’s pleasure gardens, there with the characters, seeing what they saw, even smelling what they smelled. Small details made the setting come alive—it wasn’t enough to know there were hot and cold rooms in the Roman baths, but more feeling the heat of the water soothing bruised flesh. 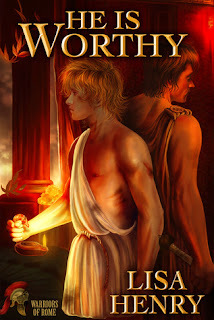 This was Nero’s court, and all his excesses jump off the page too, making this book gritty and raw, and in places it may raise the reader’s gorge. None of the history comes in infodumps—it’s all worked in organically and naturally. I was going to say beautifully, but little of the subject matter is beautiful, though ugliness can be very well done. Nero's relationship with Christians assaults Senna's senses in the garden. Not every detail is horrific. “Bructeri, not German,” Aenor corrects Senna, showing his pride and placing his tribe on the map all at once. The political tension is the greater part of the story, with furtive whispers about what prominent citizen would next declare for Galba, and everyone stepping softly lest the crazed emperor withdraw his friendship. That any kind of relationship can prosper between a man with no hope and no autonomy and a man who’s condemning himself and his accessories to a certain death must be a triumph of life. Both Senna and Aenor are deftly drawn, well characterized in a small word count. We can feel Senna’s despair as the friend of his childhood becomes the monster that will bring down the Empire. He wasn’t just planning treason, but the killing of a god, no matter how much Rome would benefit from it. If he needed redemption as a character, he achieved it by being willing to sacrifice all and die gruesomely. However, I didn’t see Senna as the villain, I saw him as the man who fell down the slippery slope. Nero didn’t start out awful. Aenor has no love to turn to loathing—his tribe mocked the Romans until he learned of Roman rule the hard way. He’s systematically ground down, and the grinding is often sexual and ugly, difficult reading. If Nero hadn’t burned his city nor slain his generals, he’d still deserve his fate for what he did to his pleasure-slave. This story succeeds beautifully as an historical piece, and that’s why I treasure it, but does it fare as well as a romance? To a degree yes, but when looked at in the cold light of analysis, it’s missing a fair chunk. And you know what? I don’t care. Normally an absent section of relationship development makes me froth at the mouth. Here absolutely everything works so well to make me relieved that everyone didn’t end up dead in the gutter after the political crisis that I wasn’t looking too closely at the transition. After finishing the book I sat transfixed, imagining for myself how the missing sections went, so perfectly immersed that I could continue spinning the story. But the details were not laid out. Connoisseurs of slave-fic might find this lacking. I find it to be more mainstream.